They start questioning the details. “Wow, did you get a travel agent to set that up?” Nope. “Did you like book a tour package?” Nope (although sometimes we might book day tours when we’re in a particular destination). At this point I usually launch into a rambling explanation that begins with, “Well, it depends if it’s a road trip from our home, a road trip from a destination we have to fly to first, a cruise, or just a normal mixed-transportation trip that includes flights, rental cars, and an occasional taxi or train or subway.” Then some additional ramblings about spreadsheets, Google Maps, ExpertFlyer, ITA Matrix, TripAdvisor, Yelp, and TripIt. By this point, friends’ and family members’ faces have long glazed over and they’re just nodding their heads in polite confirmation that they’re still somewhat paying attention. 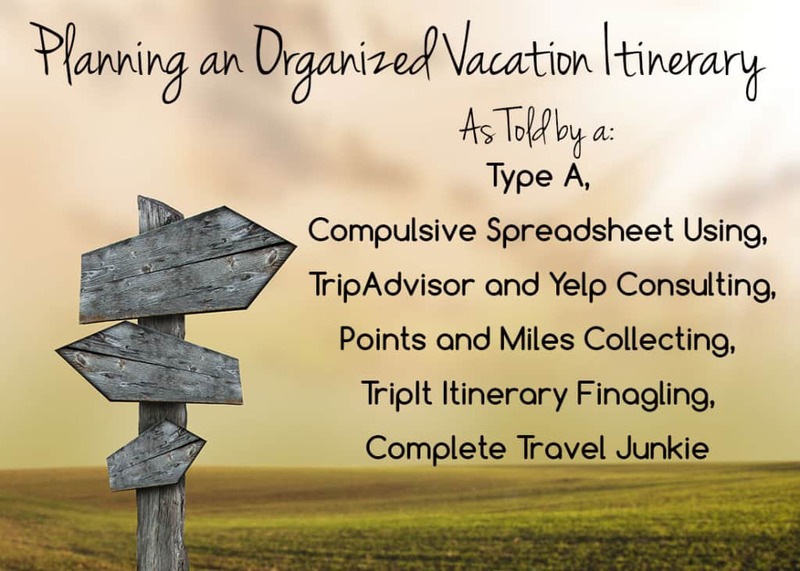 In case you’re interested (and in an attempt to organize my explanation for how I actually DO plan a vacation) I’ve listed out some steps below. 1. Consult my “Trips to Take” spreadsheet. I’ve maintained this spreadsheet for many years. It plans out the bigger trips we plan to take each year (usually one on the spring and one in the fall). It also serves as a master list of current bucket list trips and festivals (using that term loosely – more like “events”) that I want to see eventually. Don’t be fooled by how precise this looks. I don’t think there has ever been a single year that the spreadsheet hasn’t changed, so it’s always in flux. But it does help me stay organized about what some of my bigger bucket list trips are. Funny how things always get added and moved around though! I change the font to green when we actually complete a trip. 2a. Google Maps Destinations. I think this section is best described using a few examples. For years, I had been wanting to go to the Albuquerque Hot Air Balloon Fiesta. It takes place every October, and I was just so amazed by the photographs of the event. Back in early 2012, I decided that that was the year to go to the Fiesta. But then I started thinking more about it. DC to Albuquerque was a nearly five hour flight. Did I really want to take a five hour flight just to go to Albuquerque for a few days? Nah! Let’s fly to Albuquerque then make a road trip out of it! I looked at things to do in New Mexico, mostly using TripAdvisor. Then I’d open Google Maps and zoom in on Albuquerque. Then I’d slowly zoom out, taking a look at some interesting-sounding things on the map. Oh, Santa Fe? I’ve heard that’s beautiful. Oh, Sedona, I’ve heard that’s fantastic too. Oh, what is this interesting-sounding place up here? Glen Canyon Recreation Area? Never heard of that, but it sounds promising. Let me Google it. Oh wow, and the Grand Canyon isn’t far from that. Let’s check up north. Oh, that Glen Canyon area isn’t very far from Monument Valley, I’ve always wanted to go there! You get the idea. There’s nothing really precise about it. I just kind of search, Google, and develop ideas. I tend to use Evernote as a personal bookmarking site. I create an Evernote notebook for “Hot Air Balloon and Southwest Trip” and start bookmarking all the locations I’m searching for. At this point, nothing is “off the table.” If it sounds interesting, I bookmark it. 2b. Consult organized travel websites for other potential stops. In addition to the Google Maps technique, I also use TripAdvisor quite extensively. For instance, back in 2010, we booked a one week Mediterranean cruise departing from Barcelona. I had never been to Spain, so I definitely wanted to spend some time in Spain before our cruise departed. After all, why make such a long flight for just a week-long trip? So, I looked up Spain on TripAdvisor, and browsed the cities and what they had to offer. 2c. Borrow heavily from expert-developed itineraries. Friends, the internet is a beautiful thing. And so are travel books. Seriously. Sometimes travel books (like real, paper books you can hold in your hand), are very valuable travel tools. I like them because it eliminates a lot of the distractions you might come across when researching destinations online. Distractions like random one-off reviews of “I hate this place!” Anyway, one of the things I like most about travel books (like Lonely Planet or Fodor’s), is that they always provide sample itineraries, and usually those itineraries are based on how much time you can spend in each destination. A lot of them even post sample itineraries online. For instance, Frommer’s posts sample itineraries for one week in Spain, two weeks in Spain, and Spain for families. I’ve never once followed these itineraries precisely, but it usually helps give me a good idea of what the highlights are! 3. Research sites and attractions in each city / locale identified. Once I have identified potential cities to visit on my trip (using Google Maps, TripAdvisor, and sample itineraries), I check TripAdvisor and Yelp for “Things to Do” (i.e., attractions) in each city. Sometimes I eliminate cities if the attractions don’t seem to warrant a special stop. Although that is RARELY a problem! I usually find too much stuff to do in cities. But one example I could think of was Key Largo. Originally I was thinking about spending three or four nights in Key Largo. However, after I found out that many of the attractions in Key Largo are scuba-diving related (which neither one of us do), we decided to minimize our time in Key Largo to just two nights. Still plenty of time to enjoy ourselves on the beach! 4. Pare down the itinerary. Alas, we don’t have unlimited vacation time from work. Nor do we have unlimited funds (although free travel perks from miles-and-points hacking sure do help!). So, we usually have to cut back on the sites and cities identified in my previous steps. So, using the Southwest USA road trip example from earlier, we opted not to visit Santa Fe and Sedona (although we definitely hope to visit those places in the future!). Using our Spain trip example, we eliminated Valencia from our trip, and we had originally tried to fit in some stops in Portugal as well, but we decided to save that for a future trip. Whew, this post is getting long! In the next post, I’ll talk about how we pick hotels, how we optimize and plan our daily itineraries, and given some examples of how we organize all our trip information.